Although e-commerce is a thriving platform on which to sell product, I believe that nothing beats selling in a retail store. National, big-name retail chains are the key to growing your startup fast. After all, why go after small retailers when you could shoot for the stars and score a lucrative contract? Many startups covet relationships with retailers. Unfortunately, few of them understand the inner workings of how brand buyers select in-store products. As a result, startups often fumble these critical buyer relationships before they get off the ground. In my experience, brand buyers receive at least 10 pitches a week, if not more. You want your product to stand out for all the right reasons. Fortunately, with a little elbow grease, you can connect with retailers itching to sell your product. Follow these four strategies to get your product in front of interested brand buyers. Make them want to read your email. Buyer inboxes are full to the brim. They might receive dozens of email pitches each day, many of which they delete. Make buyers want to read your email by starting with good research and personalization. Make a list of 100 retailers you want to partner with. This might take some time, but it’s worth the work. Next, look on LinkedIn for buyers who work at those retailers. Make note of their departments, and ensure they’re the right contacts. If you can, search for the buyers’ assistants, too. You’ll want to CC them on your outreach emails. Use your research to write a personalized email. At a minimum, you need to use the buyer’s name. Your subject line and email copy should make them want to keep reading. While clickbait gets a bad rap, it’s a good skill to use for this email subject line. Be flashy and sensational, but not spammy. Highlight anything exceptional about your product, such as press, endorsements, celebrity features and how often you’ve sold out. The real work begins once a buyer expresses interest in your pitch. You need to start building trust with the buyer immediately. Be extremely responsive to their follow-ups and questions. This shows the buyer that they’ll have an easy, positive time working with you. If they request any information, send it over ASAP. If the brand buyer wants to meet, suggest two or three potential times. It’s much easier to work with specific times and avoid the email back-and-forth. You can use tools like Calendly to simplify scheduling. Get your ducks in a row before you meet the buyer in person. Know your profit margins, and have a plan for the product logistics before your meeting. This shows that you know your stuff and that the retailer will benefit from partnering with you. Be thoughtful about your samples. Samples are your chance to shine. Don’t fall into the trap of mailing a plain cardboard box. This isn’t going to cut it; you want to wow the buyer. Send branded, high-quality sample packages that get the buyer’s attention. First, remember not to bombard them. Send only the most relevant, successful samples to your buyer. Second, make sure the samples are packaged safely. You don’t want them to explode in transit. Third, personalize who the package will be sent to; this increases the chance the buyer will actually open the package. Put thought into when you send your samples. For example, if a retailer is doing a green-living initiative, that’s a good time to mail samples of your green cleaning products. Invite them to your booth. 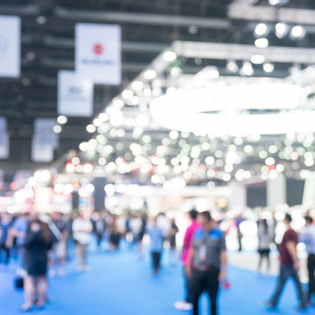 Are you on the trade show circuit? If so, you have a critical opportunity to connect with brand buyers in person at these events. Face-to-face interaction at trade shows gives you the opportunity to demonstrate your product, answer questions and build relationships. If you can, look at the attendee list before you go to the trade show. Schedule a time to meet at your booth with the buyers in order to maximize your time. Retail is very competitive. Stores have narrow profit margins and big overhead. As a startup, you need to prove that your product is worth the risk for retailers. Make it as easy as possible for them to give you a yes with these four tips. You might get a few rejections, but don’t let them deter you. The right retail partner is out there for you, ready to grow your brand in front of millions.